There are many channels in the body. Before we talk about the most important channel we must first understand the second and the third most important channels. The Ren任脉 and Du Mai督脉 are equally important and these are the second and the third most important channels in the body. The system of channels or meridians is called Jinglou 經絡. 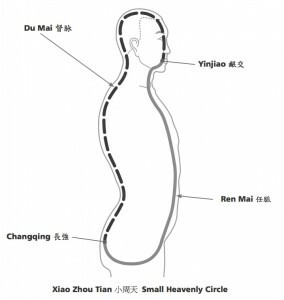 The main channels in the body, like the Ren, Du, Dai etc, are the Eight Extra Channels which we call Mai脉. The Eight Extra Channels or Eight Unusual Mai奇經八脈 are stronger and allow more Qi to flow around the body. They are like the motorways which can take more traffic in the UK. The second and third most important Mai are the Ren and Du Mai, why is this? This is because, If more Qi is able to flow through the Ren and Du then the 12 Ordinary Channels will be smooth and in good condition. When these channels are smooth and in good condition, then it means all the channels of the internal organs are strong and healthy, and it also means you are healthy too.